MAPUSA: Down by a goal, Milagres Sports Club recovered strongly to thrash Saligao Sporting by 6-1 in the GFA’s 2nd Division League match, organised by GFA and played at Duler Stadium, here on Thursday. Milagres who are yet to taste defeat in the league regrouped themselves and levelled terms in the 32nd minute. Albino who was moving dangerously toward the goal was hauled down to the ground by Videsh Satardekar, referee Deepraj Sangelkar without hesitation pointed to the dreaded spot. Valito Miranda who stepped forward did not make mistake with the spot kick, 1-1 Schubert should have consolidated the lead for Milagres four minutes later but failed in getting the better of Saligao keeper from close range. 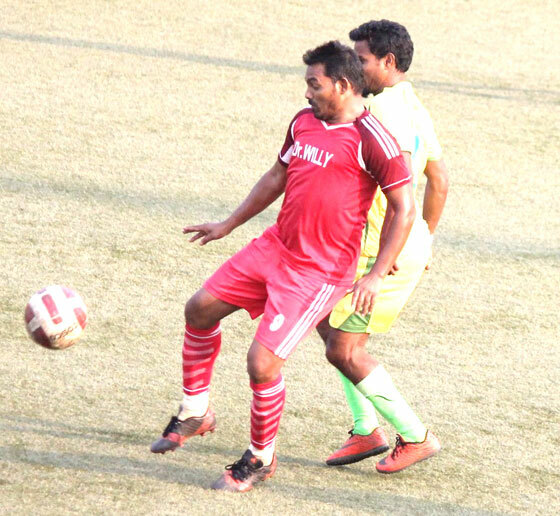 Milagres were a different unit on changing ends and made it 2-1 in the 51st minute when Albino Pereira showing great footwork outfoxed the advancing Saligao keeper Gauresh Naik and tapped the ball into the nets, 2-1. South Zone: In another match at Ambelim ground, Cannut Fernandes scored a second half equaliser for St Sebastian United Club to cancel out Alvito Moura’s first half goal netted for Sao Jose de Areal Sports Club. The match ended 1-1 draw as both teams had to share the spoils. Meanwhile at Dramapur ground, Sports & Welfare Club Zaino came from behind to hold Carmel Sports Club 3-3 in the salcete zone. Jade Colaco had give SWC Zaino a sixth minute lead but Paxton Gomes made it all square for Carmel SC in the 27th minute. Abhay Shetty then gave Carmel SC the lead just before the breather. Changing ends, Carmel SC further inflated the lead at the hour mark through Agnelo Colaco. But two goals cushions were never safe when SWC Zaino had showed great attacking prowess in the game. Their constant efforts and hardwork finally paid off when they scored two goals in the span of three minutes. Leslie Fernandes reduced the margin in the 77th minute before Samson Fernandes scored the equalising goal in the 79th minute. The scores remained 3-3 till the final whistle.